Get to know the European representatives at the Grand Finals. Team Schoolbus came a long way before we became what we are – we`ve had our ups and downs, we`ve changed players and play styles. Everything we did had a single goal – to become better until the point when we will challenge the strongest teams of the world at the Grand Finals. We rely on our skill and flexibility when playing the game which we have achieved by playing together for a very long time. 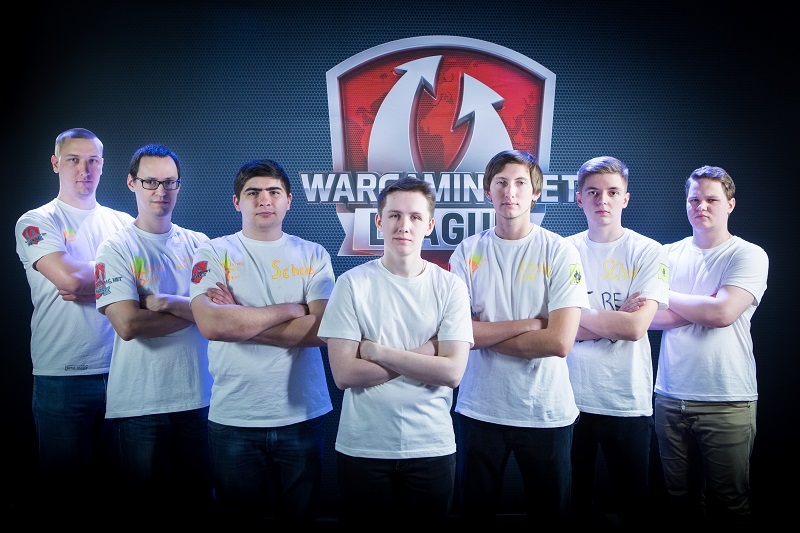 This entire time we`ve had an awesome experience of communicating with other teams and players as well as both WG and ESL staff, we`ve made a lot of friends and great time on LAN events. This game is not just about fame and money, it’s also an awesome community which goes along you every step of the way – you always have friends, fans and just random people cheering for your team, which boosts your moral and dedication, and we are thankful for that. We will do our best to become the best and have as much fun along the way as we can. See you on the battlefield! My name is Alex Nogin. In WoT I’m known as Arclit. I’ve played WoT since Open Beta. I joined the team about two years ago back when it was known as Synergy. A year ago, we made some major changes and since then we are Schoolbus. I don’t have a single favourite map, but I like those introduced into the game earlier on more. Jagdpanzer E 100 – it’s big, it’s armoured, it hits hard. It’s just so cool. You can’t really put your finger on it when you play in the team like ours – we just have this chemistry of players that makes us one. But for the most part I cool things down when guys get too nervous or excited and bring my own perspective to different situations in battle. You have to set your goals and commit to them. Never neglect people you play with – only being a part of the team will make you successful. It combines strategic thinking and action packed brawls. It’s like chess by Nolan. They didn’t believe that e-sports is a real thing until they saw a paycheck. We practice a lot, work out new tactics, find our weaknesses and work on them. We party together the night before tournament. No alcohol though. When I left my first team, I was looking for a team with potential, so I could make them stronger and we could make our way to the top. One of my friends suggested a new game about tanks to me when WoT was in open beta. All the boys like tanks. I`ve been playing ever since. I was good at this game but never thought about taking it seriously. Then I was approached by one of the top e-sports teams at the time and offered a place. At first, I rejected the offer because I thought that being a pro take too much time, but then I was explained that most guys in the team have real jobs or study full time, so I decided to try. We practice more than usual, most of the guys abandon any other activities to spend every minute on preparation. When we got rid of our previous captain and became Schoolbus. To become the best of the best and have a good time of course. Good relations in the team, a team of friends is always stronger than a team of pre-paid pros who just do their job, it has stronger moral which is vital in WoT e-sports team. Team Virtus.pro is one of the oldest in “Tanks”, its roster has changed many times looking for better players. Only one player from the original roster is left. A continuous process of changes and improvements – allows the team to always be one of the favourites for any tournament. However, our team has made mistakes several times or was a little weaker than our opponents, so we’ve placed 2nd or 3rd, letting the tournament champion title slip from our hands. It has happened a few times because of our underestimation of the opponent’s strength. We will arrive to the Grand Finals simply as one of the 12 teams. We hold no assumptions on how strong or weak we are. We will try our best against every team. There is no need to ask – “which place do you want?” Any player will always answer the same – “I want to be the champion”. The results of our hard training will show on 25th-26th of April in Warsaw. When did you start playing World of Tanks? When and how did you get into World of Tanks? I started playing WoT at the very end of December 2010, when my friends came to visit me and brought a bunch of laptops. One of those laptops had the newly released and rapidly growing in popularity WoT installed. I got into it very fast; it was such fresh and unusual gameplay in comparison to the usual shooters and games about elves and orcs. I am going to skip this question, because I will answer it in the question about the team. My favourite map is Cliff. I always liked it more than others, both in random matches and in competitive mode because it allows a great variety of actions and simply its visual design. Right now, I play as a Bulldog and drive to the lighthouse more often that others do. I place much higher than the rest of 14 people in the round. I feel my superiority over them! Hahaha! Taking from the list of the tournament vehicles, IS-3! The Soviet breakthrough tank. So much armour. So much damage. But to be “serious”, it is so much easier to play, so most of the time they put such noobs like me and break_neck in easier vehicles. I was always the player that talks more than anybody else, who explains his opinion, even when somebody does not like it. I always helped the team by working with the organizational matters, although I never was a manager. For me it is not hard and nobody else wants to do it. Recently, I became the manager of the team, to unload some work from Diver233, who is the main manager of all the Virtus.pro rosters. Although, during the LAN finals I am simply a player and dump all the problems on him, because I do not want any distractions before or during the game. To briefly describe myself – a player, a manager and a troll that never shuts up. A lot of work. Even during the downtime, you work 6 days a week 4 hours a day minimum. Not counting the fact that you have to play random matches and sustain your personal skill. On the eve of major tournaments, the amount of hours of preparations goes up to 10-12 a day. In WoT, you cannot win a match 1vs5 like in CS: GO. Every role in particular and teamwork in general is very important. Every one of you could be the most skilled players in the world, but without good coordination, any team with worse players but better coordination could beat you. The answer might be a bit too obvious for me. To be the best of the best, of course. For my team to step on the podium as winners and stay there forever. Have you ever heard somebody say that their goal is go get to Top 8 and that’s it? If you have – they lied. My friends and relatives have supported me for a long time. People who first hear of it most of the time have nothing to do with it and know nothing about eSports. They just get surprised about the fact that there are so many ways to fulfil yourself and earn money. Practice, watching replays, analysing your mistakes. I try to play 1v1 with my teammates and play random matches more often. There are no rituals. The only thing I do for LAN finals is I try to relax, mute TeamSpeak and play one of my favourite music tracks after I warm up before the start of the match. How did you become involved with your team? How long have you been with your team? It was so long ago. I was one of the first. The story of our team begins in December 2011, when we gathered as players from the team RED: Aces. Our first captain, Derp, called players from the clan to play in some new tournaments. By that time, I grew bored of Clan Wars and “random battles”. It was a good chance to play against smarter opponents. A little after 6 months we joined Virtus.pro. Many players have been replaced since. The only player left from the original roster is me. I cannot say that I play better than the rest of the team. I’ve stayed in the team for 3 and a half years because I dispose of those who dislike me faster, than they can dispose of me =). As always, before the tournament, we spend one week in a boot camp. We gather our team in Moscow and play 10-12 hours a day on Virtus.pro base. We practice with other teams. We watch replays and analyse them. We train on our own against each other. We test some new positions. During the LAN Finals, before important matches, we huddle, talk to each other for a few minutes, raising morale. After that, we shout some chants to energise. During the game we High Five each other to keep the morale high, even when we lose. The defeat. I remember this disgusting feeling very well, the feeling when you lose the final and take 2nd place. We always lose for different reasons. Tactics were bad, someone did something stupid, opponents played better. However, the strongest in the memory is this – “You are playing worse than someone else. Be content with it.” The fact that we’ve lost more major tournaments than we have won has blurred my memories of those few joyful victories. Those were amazing! Hmm, probably the same as my own. I do not separate the two. To be more exact – it is winning the championship title on the Grand Finals of 2015. We want to prove to ourselves that we can win. We have been hungry for victories for this past year. Many factors. The desire to win – you can’t go anywhere without it. Everybody knows the saying – “no pain – no gain”. It is pretty much the same. You will have to train hard, analyse your mistakes and lose to stronger teams. You can improve by drawing conclusions and prove that you are capable of winning. All of it is called discipline and your will to be victorious. It is no less important to find a good organisation that will help to take some pressure off the team and its captain. Playoffs Single Elimination format does not tolerate mistakes. This will make it more interesting for the viewers watching the matches and will make it harder to predict the winner. Moreover, this will make it much harder for the players, because every team has only one chance to prove that they are better than their opponents. We will try our best to show what we are capable of and make our fans happy. Cheer for us and support us in Warsaw. If you cannot attend the event, then definitely watch the streams of the tournament on the official channels. It will be the most amazing tournament in the eSports history of World of Tanks. I want to thank our organization – Virtus.pro, which took all of the organization trouble upon itself and is helping us with everything we need. We feel confident about the future. Thanks to all this, we completely devote ourselves to training without any distractions. Special thanks to our main sponsor - BenQ, with whom we are working productively for many years.